For most painters, making art begins when brush is put to canvas. 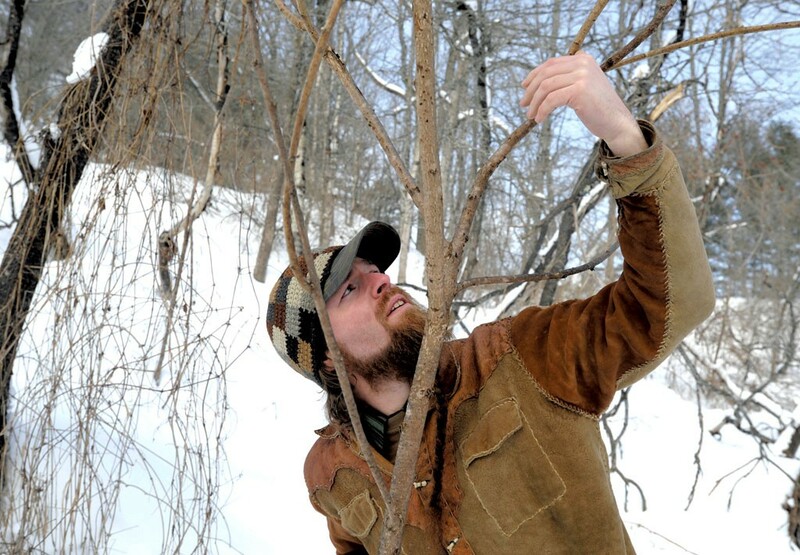 But for Nick Neddo, a wilderness skills instructor and artist living in Montpelier, the creative process begins with the paint itself. 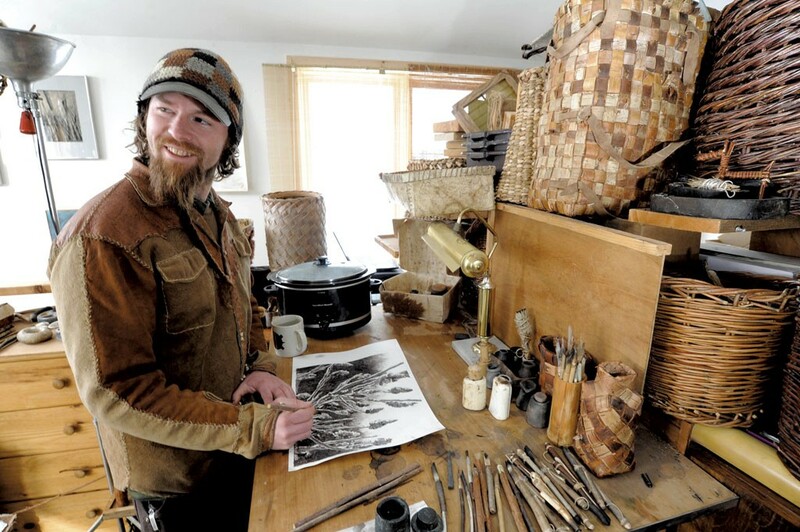 For the past five years, the Vermont native has made his own art supplies from foraged roots, clay, sticks and stones. "There's already hours and hours and hours of work before the ink even touches the paper," said Neddo, who's in his mid-thirties. "By the time I finish a piece of art with materials that I've wildcrafted, there's a much bigger context around it." On a bright morning in early February, Neddo, clad in a leather shirt he'd tanned and sewn himself, invited a reporter into his studio. It's located on a mountainous, unpaved road just a 15-minute drive from the Vermont Arts Council's Spotlight Gallery, where an exhibit of Neddo's paintings and drawings is on display this month. A quick look around the loft-style workspace revealed his handiness: stacks of handmade woven baskets, leather bags and not-yet-transformed furry hides. Then there was the artwork. The walls were hung with Neddo's graceful drawings and paintings of trees, flora and wildlife; his desk was covered with surprisingly elegant handmade paints, brushes, charcoal sticks, pencils and paper. Downstairs in the kitchen, sumac leaves simmered in a Crock-Pot, turning into ink; Neddo's current project was a drawing of sumac plants made with materials he'd sustainably harvested. "This is the first time I've used sumac ink, so I have no idea how it's going to behave," the artist said. "So I'm unlocking some of its secrets. It's still luring me in, you know?" Neddo shares some of the secrets of natural materials that he has already "unlocked" in his recently published first book. The Organic Artist: Make Your Own Paint, Paper, Pigments, Prints and More From Nature is a cookbook-style guide to wildcrafting art supplies, ranging from simple charcoal sticks to natural inks. "I love drawing and painting and I love wilderness skills," Neddo explained. "Something happened in the past few years where I got tired of compromising one or the other of these two large passions in my life." 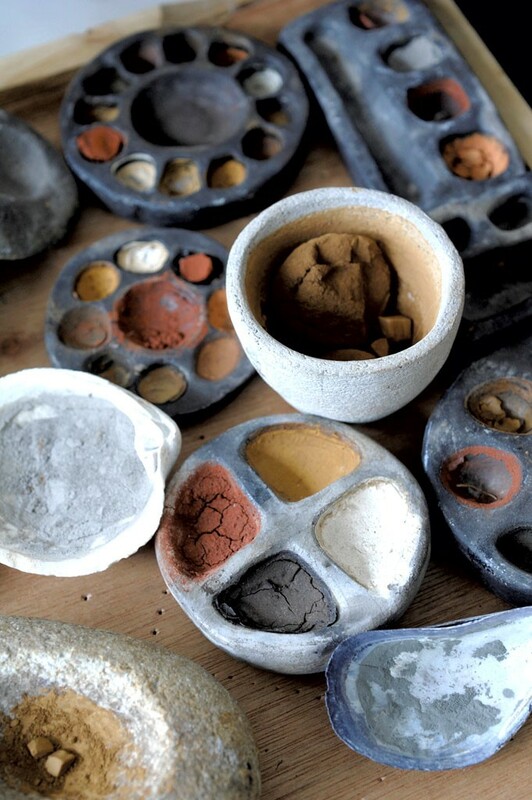 So five years ago, Neddo challenged himself to an experiment: He would create art materials using only ancient tools. He researched and tested extensively, then shared his initial findings with a weeklong class for young adults at central Vermont's ROOTS School. In 2013, Neddo got a call from an editor at Quarry Books who'd seen his work on the wilderness program's website. Having recently emerged from 18 months of intensive writing and illustrating — "It's amazing I still have a place to live, and a girlfriend," he quipped — Neddo sat down with Seven Days to talk creativity, the stone age and human survival. SEVEN DAYS: What's the value of making art with handmade supplies? NICK NEDDO: I think that's yet to be determined. For me, I can say that it's more valuable than what I was doing before I was making my art supplies. I was using just modern, mechanical pens and doing, like, nice little drawings with cross-hatching. When I had the idea to start getting into my own art supplies, I was kind of reluctant at first. It seemed messy and cumbersome and, like, redundant. But when I started making my own pens from turkey feathers and my own ink from, you know, pine soot and other stuff ... I realized that before I even put the pen onto the paper, the art project had started long ago. SD: Does that inform what you draw or paint? NN: It can. I go back in my mind to that place in the forest where I found that pine stump, or got the source to make the ink. For me, the value is increased just because I feel more connected to the process, and to the landscape, which is kind of my whole goal. SD: Does that connection inspire you? Is the landscape your muse? NN: I dedicated my book to the muse, whoever she is. I personify the muse as, like, creativity embodied ... And I've learned to recognize, "Am I inspired? Oh, yeah? OK, nothing else matters right now!" Which also causes problems, because I might be inspired all night; I might be inspired for two days straight. But creativity is a gift. I think it's a gift to our species. It's like one of our superpowers. SD: Do you think we all have that superpower? NN: I do. I think that's one of our defining characteristics as people. I think every animal or creature has its superpower, if you will, that's really well adapted for its environment. For humans, our environment is all over the place because we're innately adaptable. We learned how to sew and make clothing so we could move away from the equator. To me, adaptability and creativity are one and the same. You need to be creative in order to be adaptable, and without that we wouldn't be here. I'm convinced. Our species would not have made it 200,000 years. And I don't think we'll make it another 200 years without adapting more. I think that's crucial, so I'm kind of tooting the horn of creativity, like, "Hey, people! Creativity is fun!" It's one of the ways we feel alive in the world, being creative and engaged, making stuff and solving problems and innovating things and bringing those things to life. The Organic Artist: Make Your Own Paint, Paper, Pigments, Prints and More From Nature by Nick Neddo, Quarry Books, 160 pages. $24.99. The original print version of this article was headlined "Sticks and Stones"